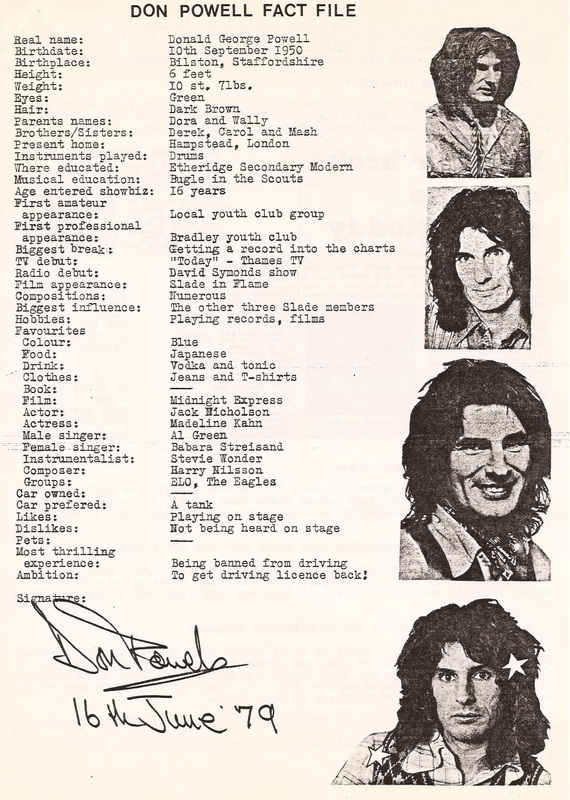 In late 1978 I had left school, started work and had a few quid in my pocket. 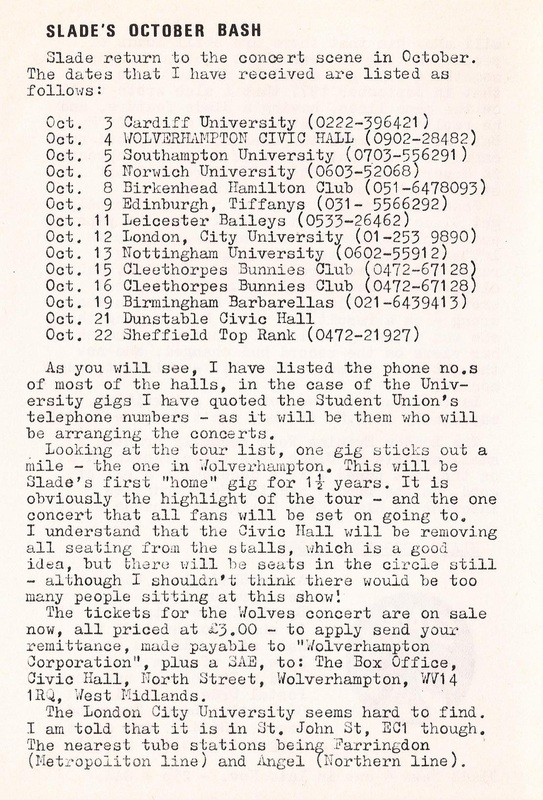 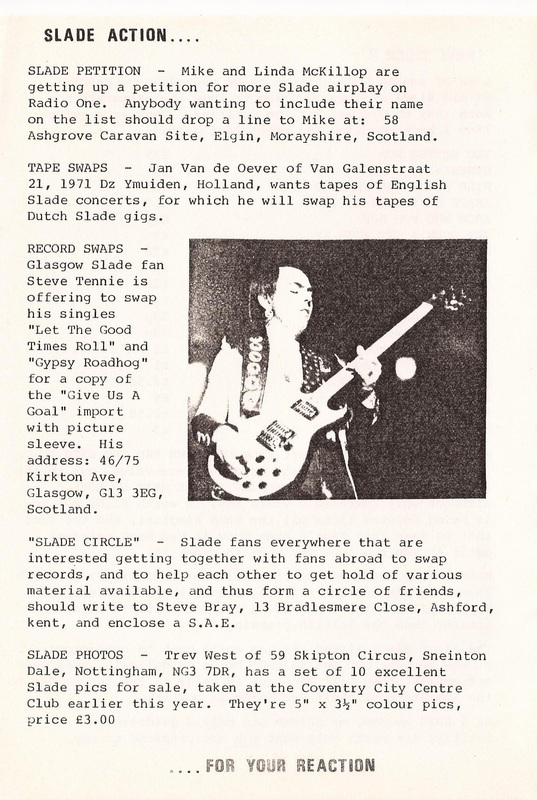 Slade were now touring heavily in the UK - and I was getting to see lots of gigs. 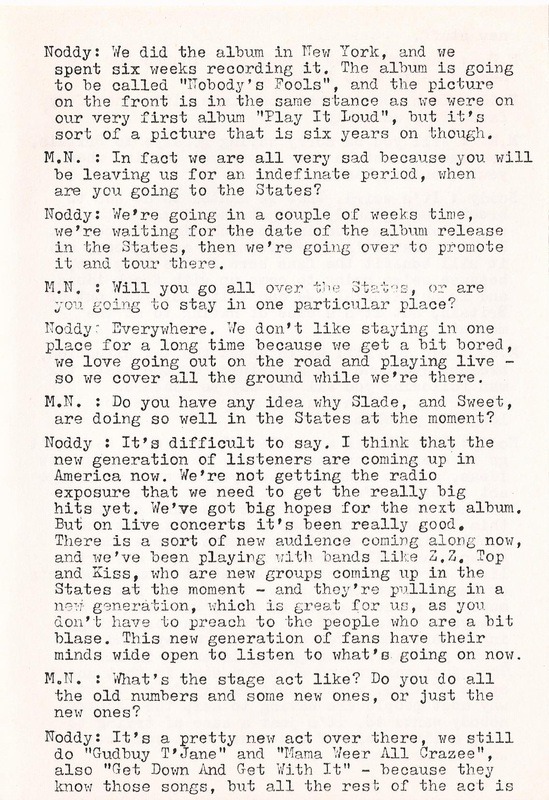 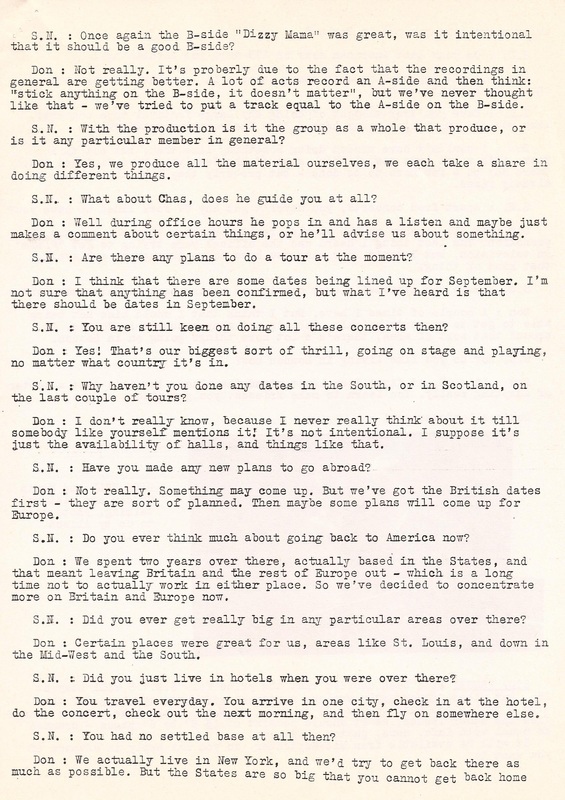 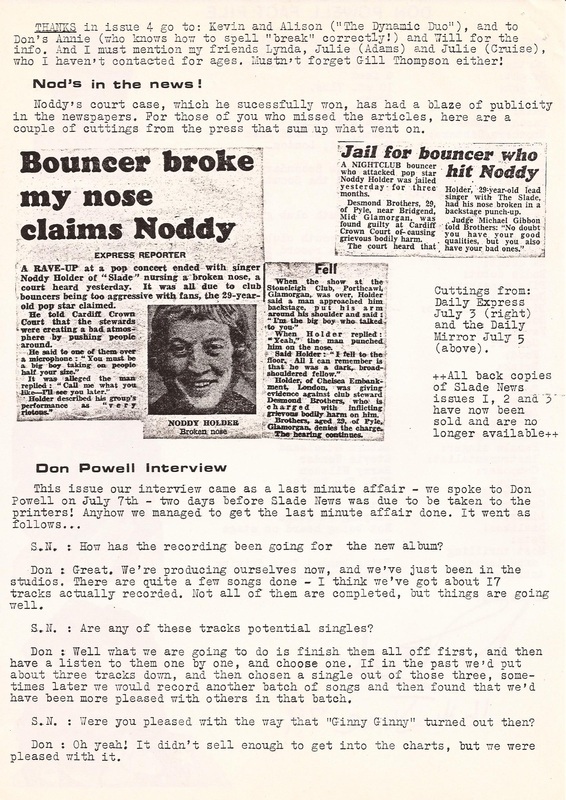 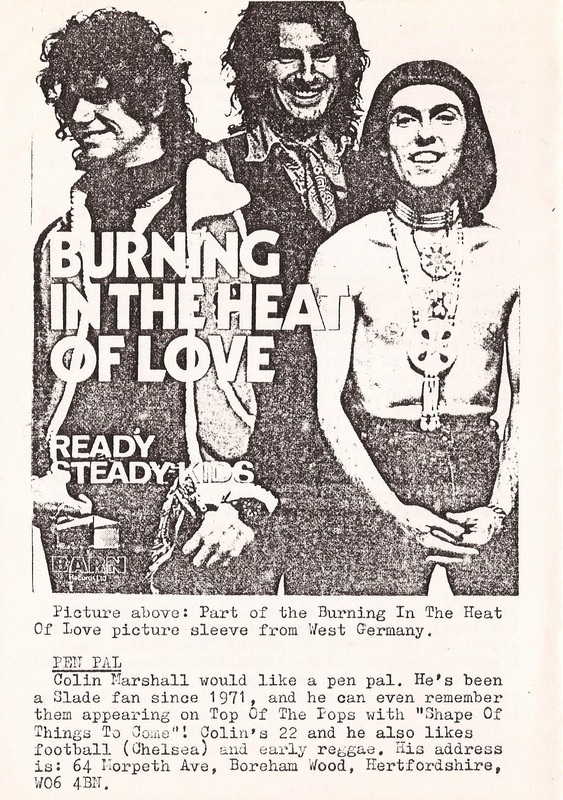 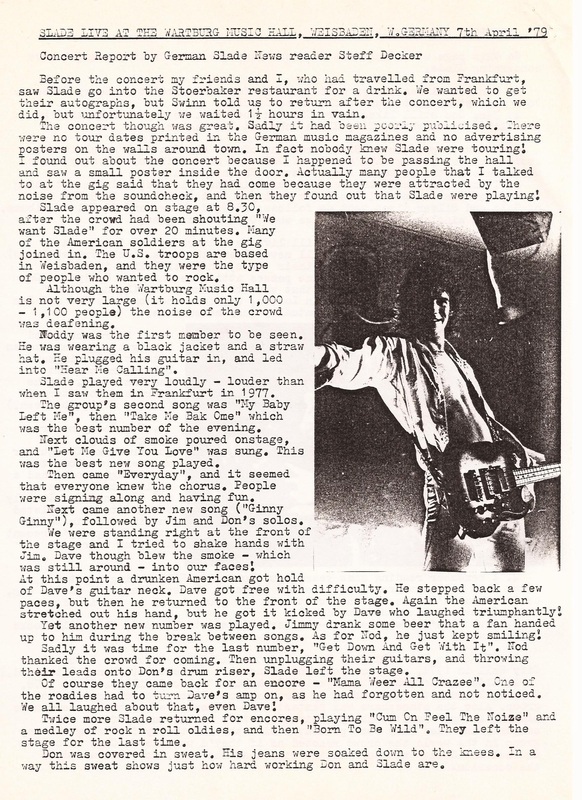 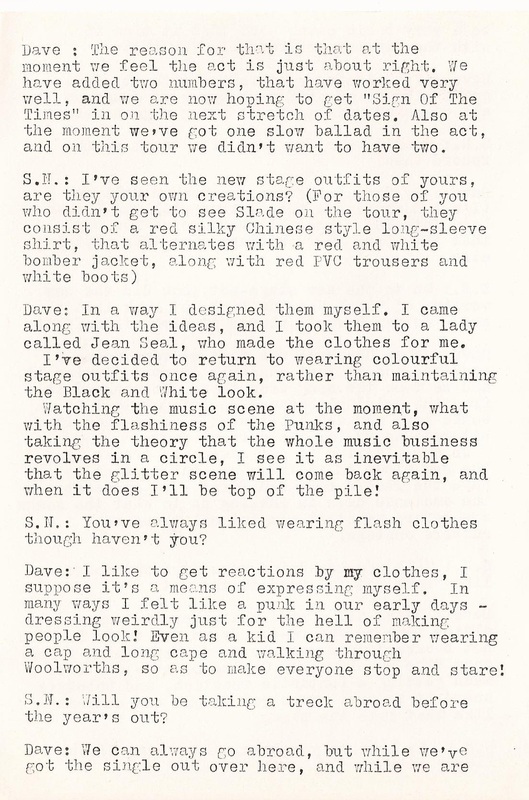 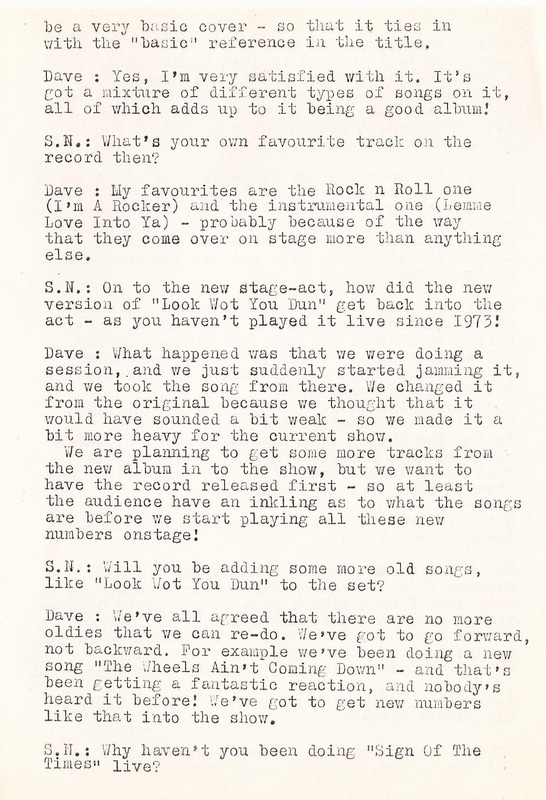 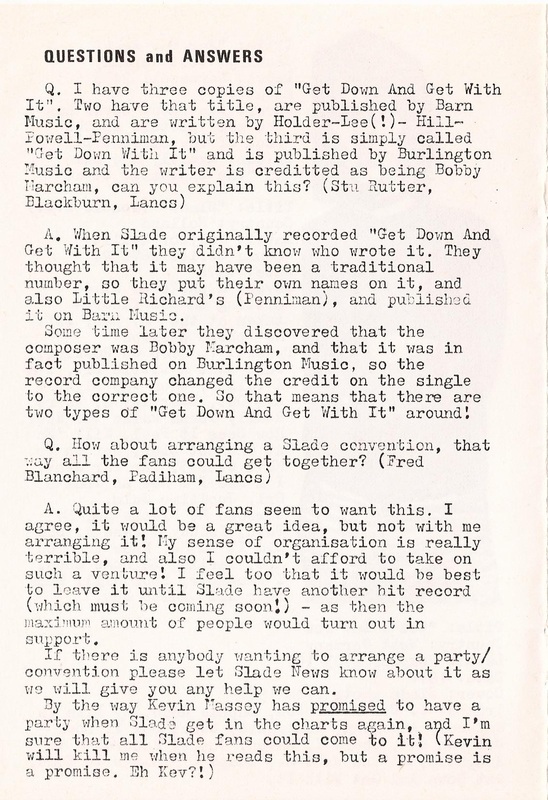 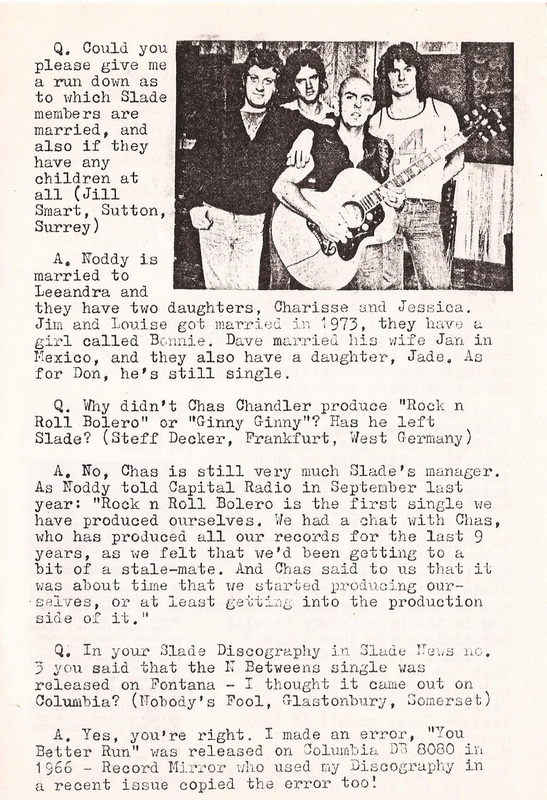 However, there was virtually no information about the band in the music press. 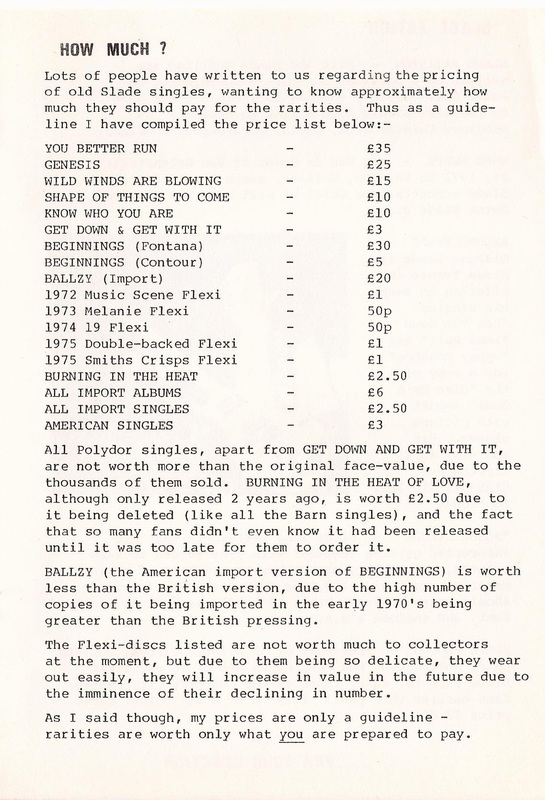 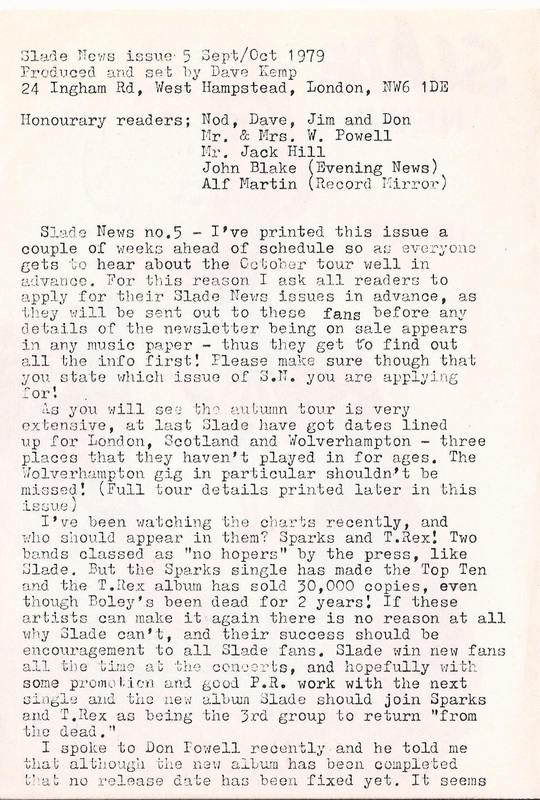 Me and other fans would often pass on details of impending record releases and gigs by word of mouth. 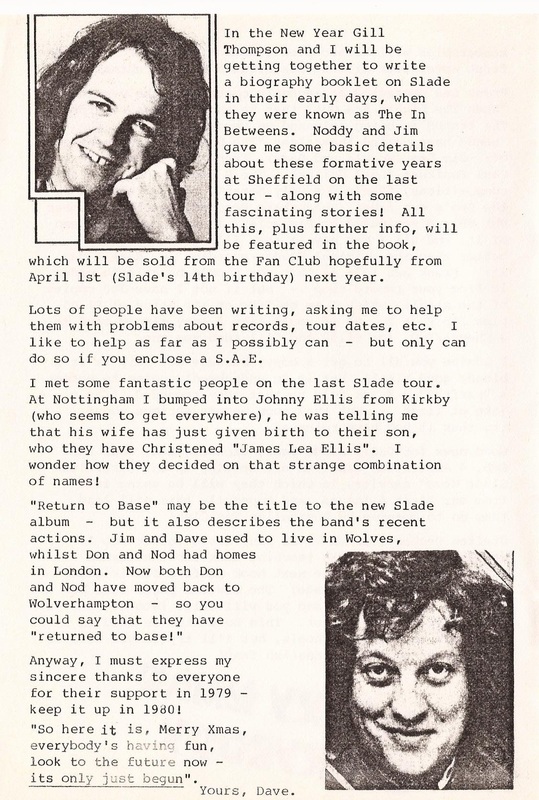 I complained to the band, and in particular Jim Lea, that it was very short-sighted of Chas Chandler to have closed the Fan Club. 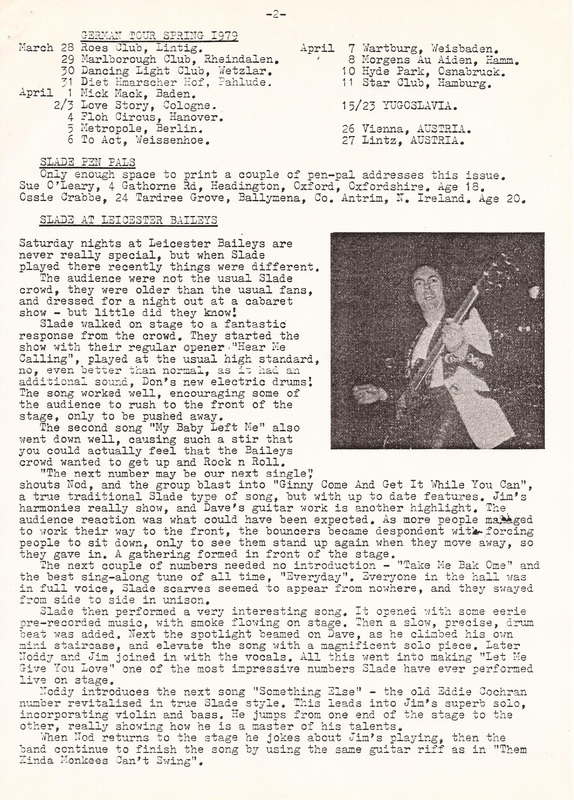 It was an ideal medium for the fans to find out the latest info. 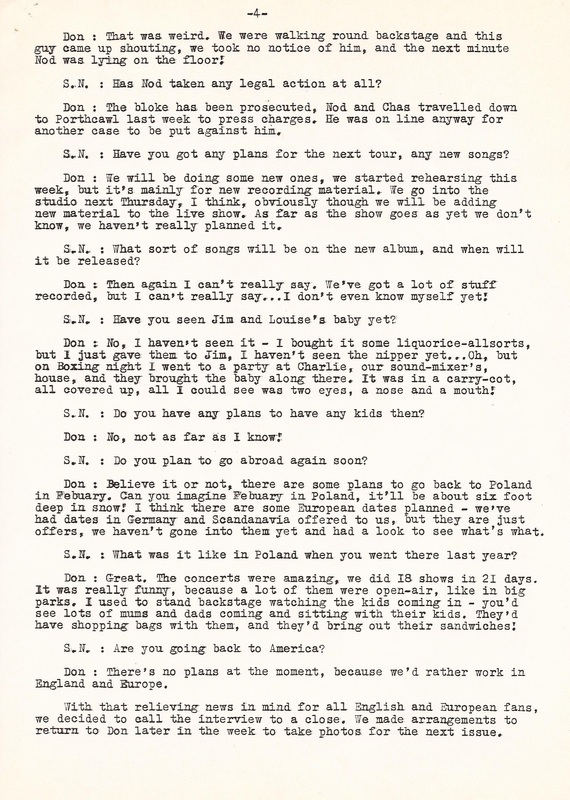 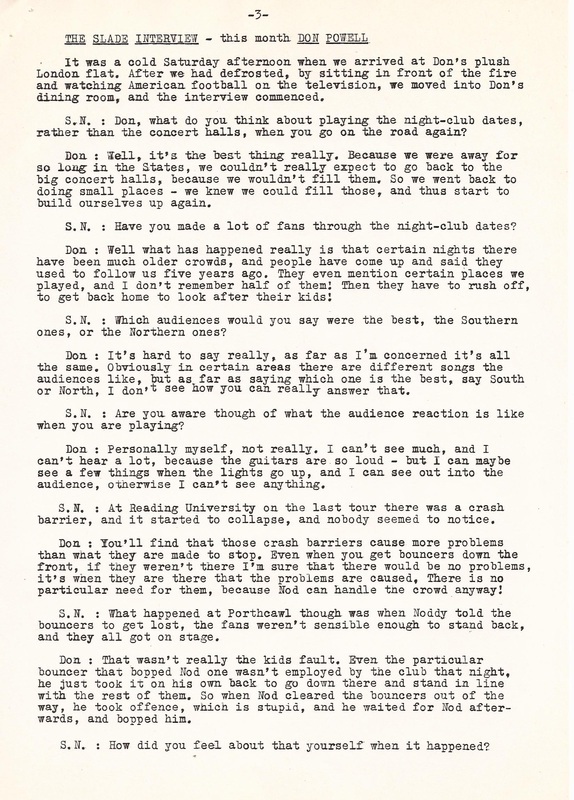 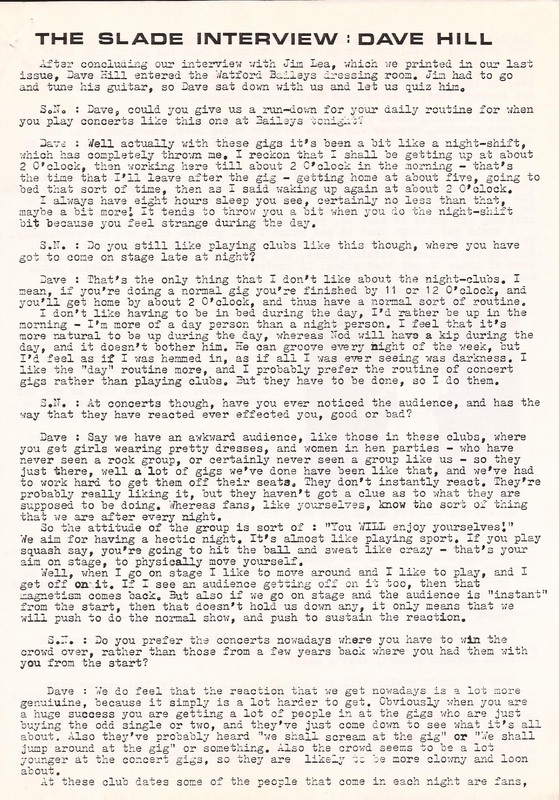 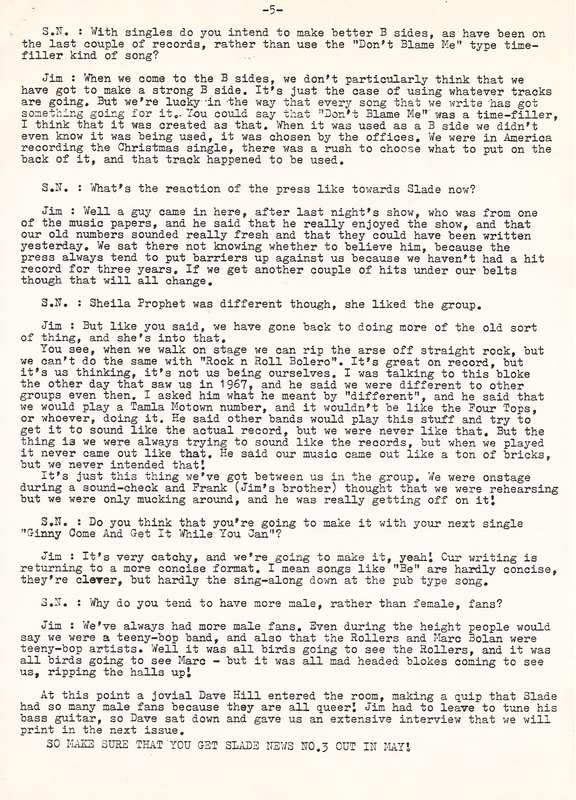 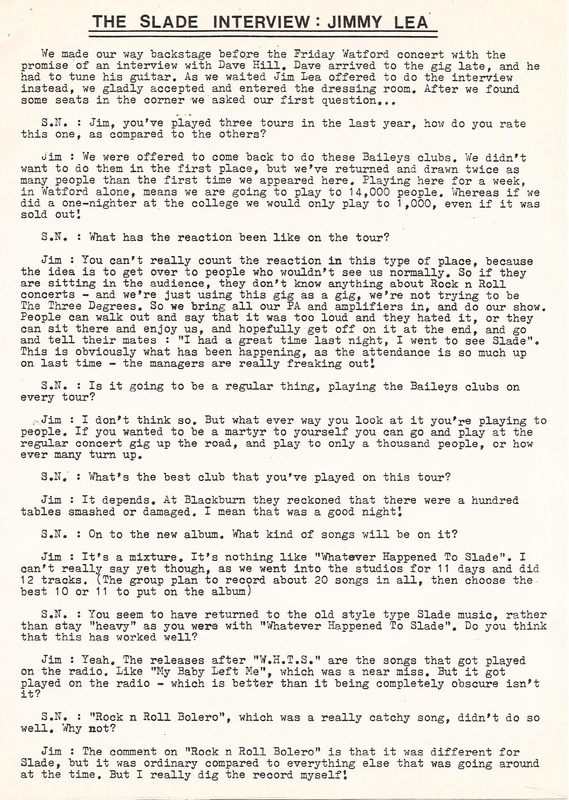 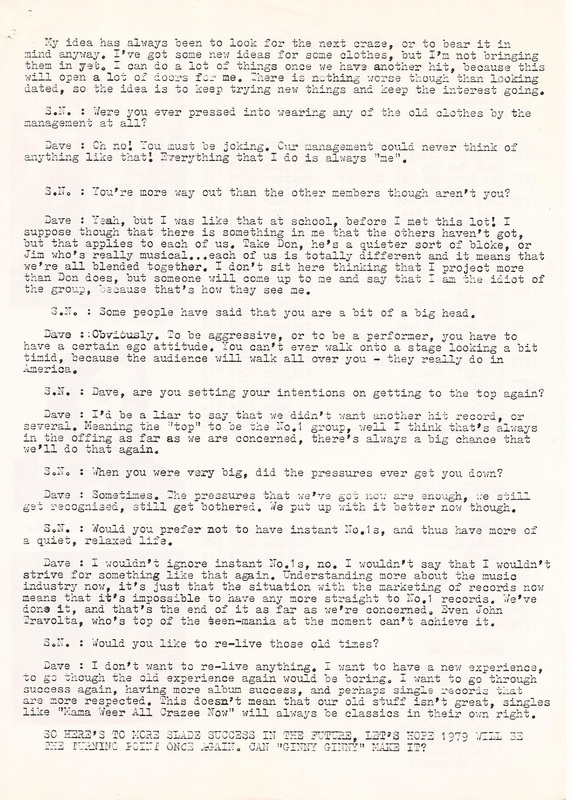 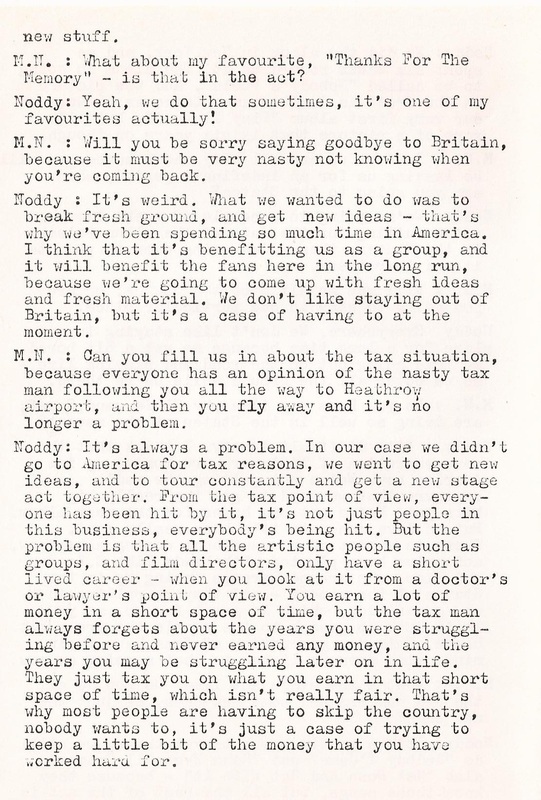 Jim explained that the Fan Club had become unprofitable. 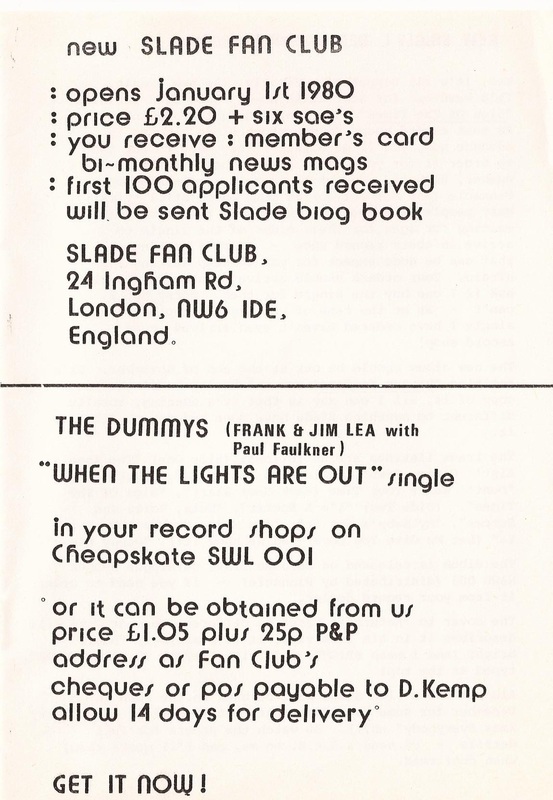 Membership had dwindled and it was costing more to run that income that was being received in membership fees. 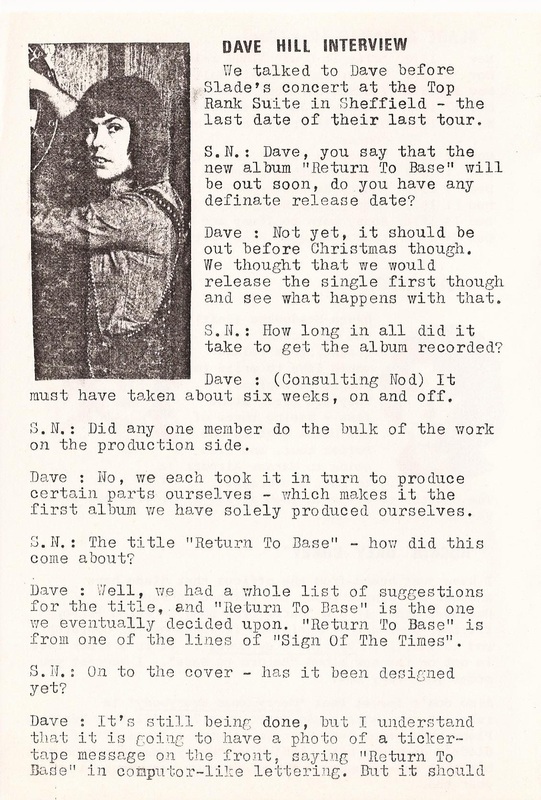 However, I kept banging on that it needed to be re-instated. 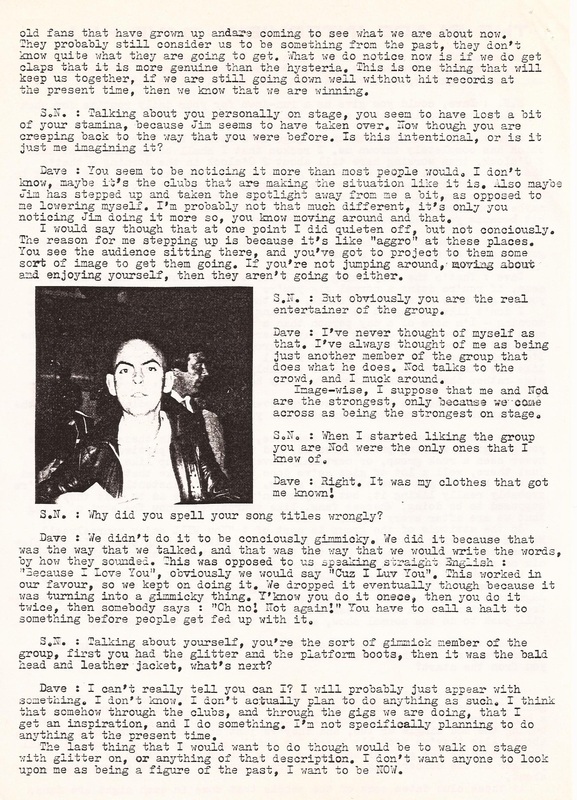 After one gig Jim said to me "Look Dave, you come to all the gigs, you're in touch with us - if you want a Fan Club, then you run it". 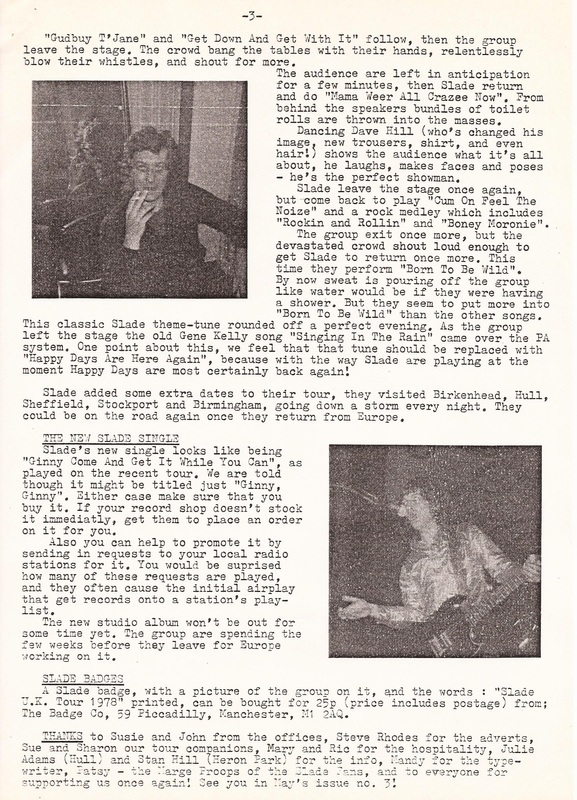 In my school days I'd helped out an unofficial school magazine (poking fun at teachers and pupils) - so I had a little experience. 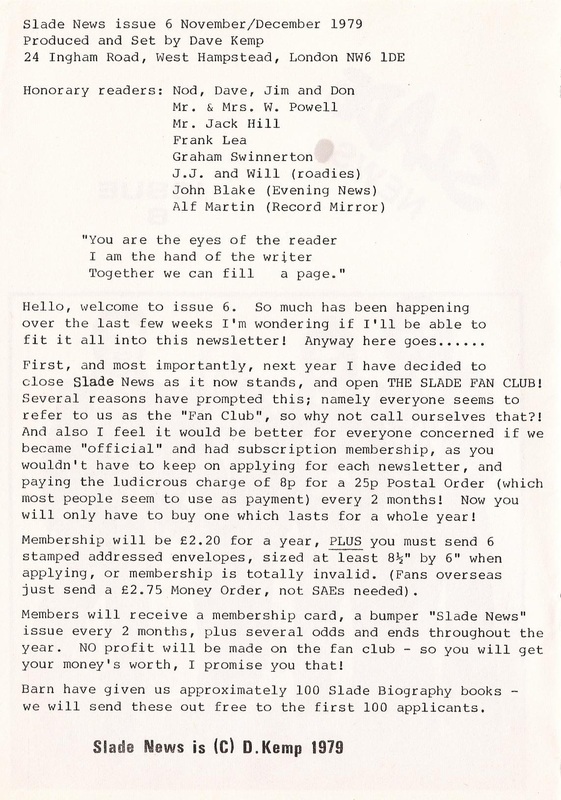 I didn't want to go immediately into the venture and run a Fan Club with the commitment of taking members fees and producing loads of newsletters. 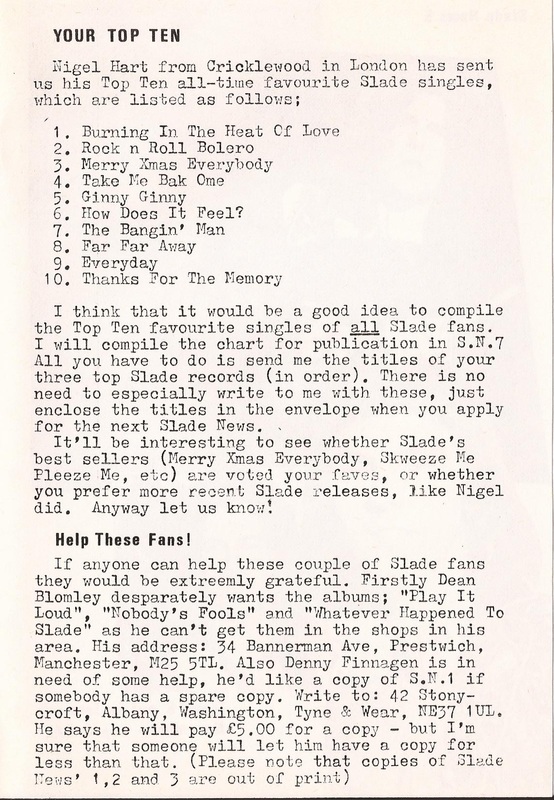 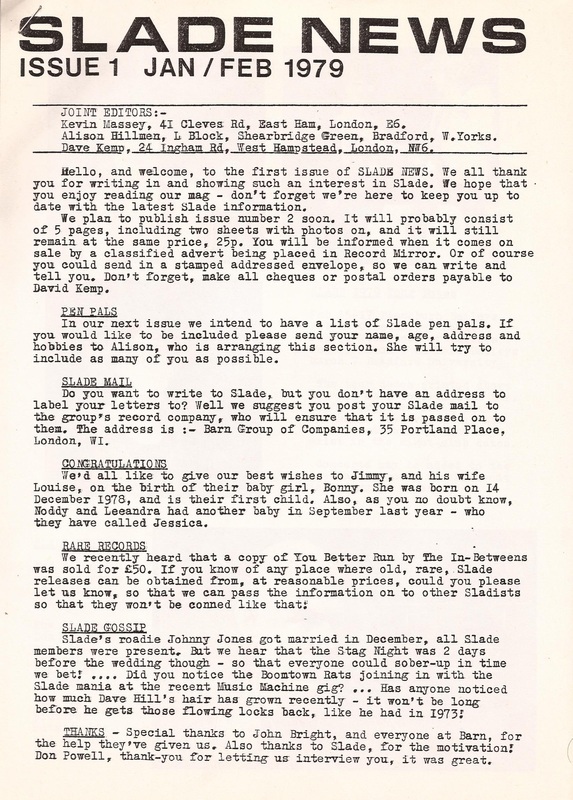 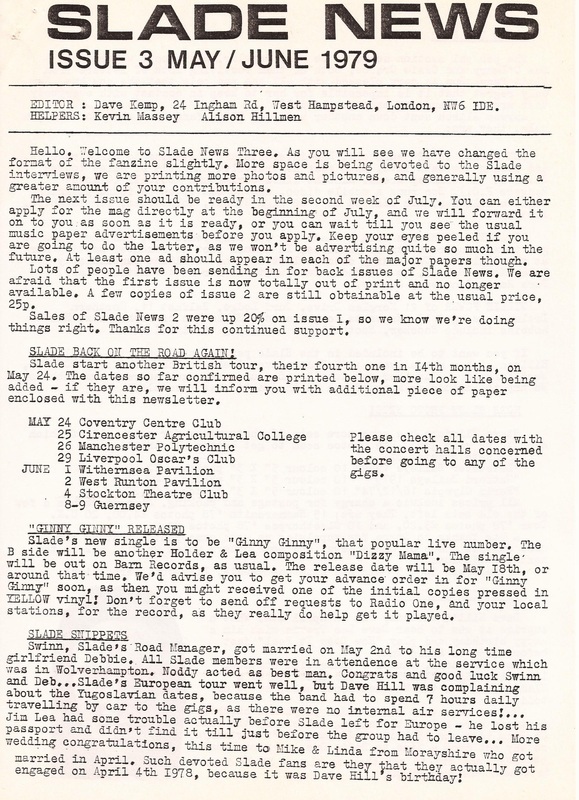 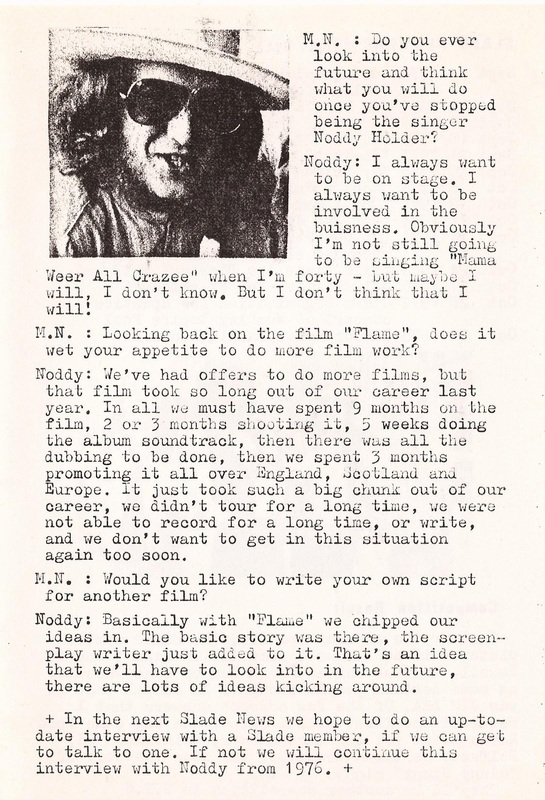 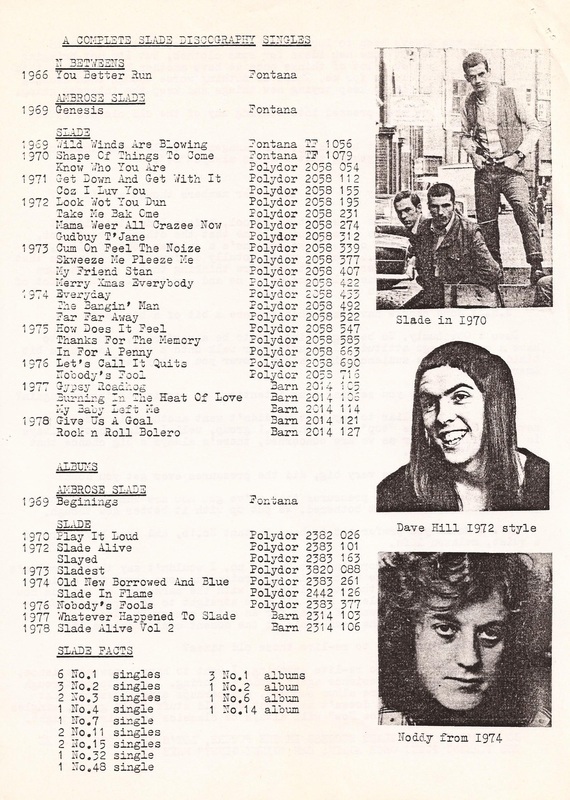 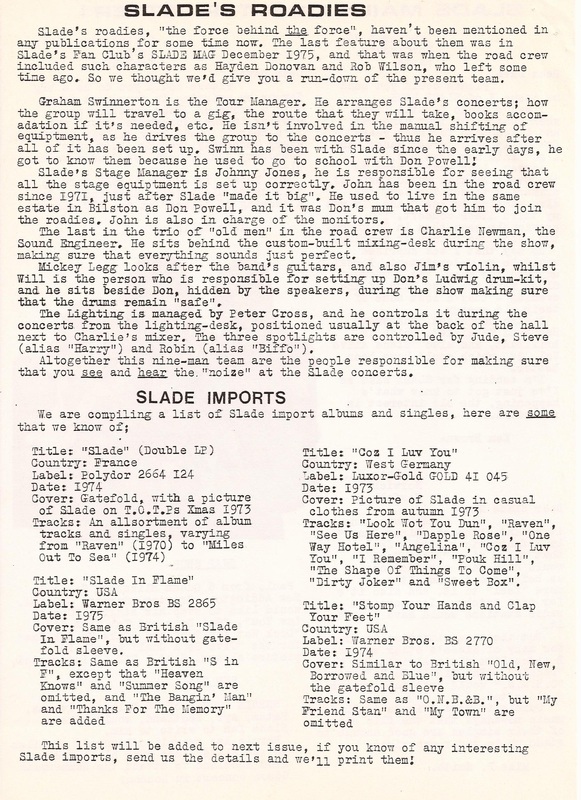 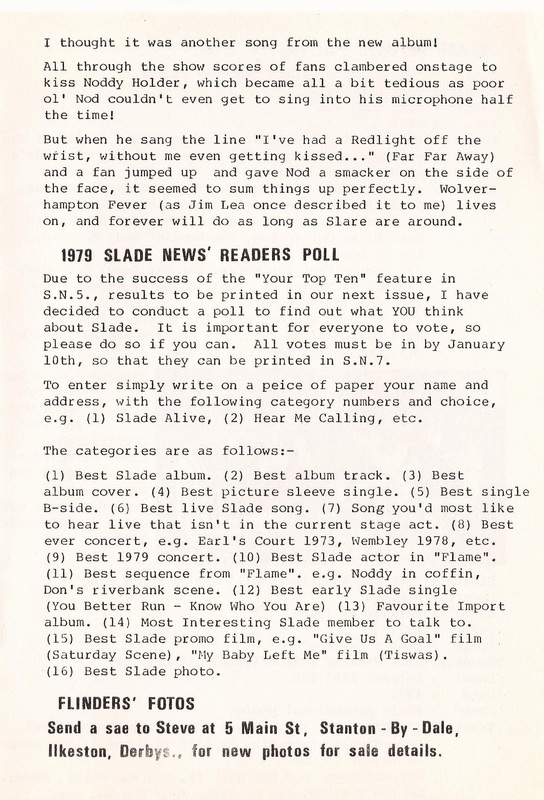 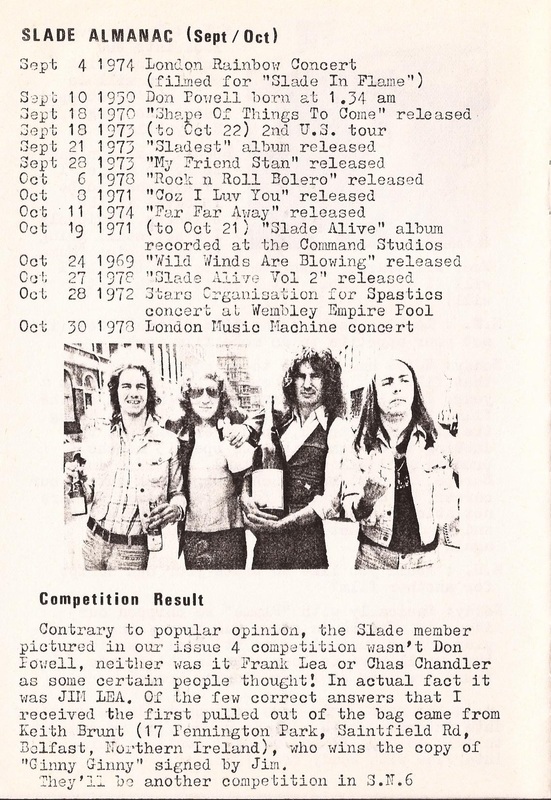 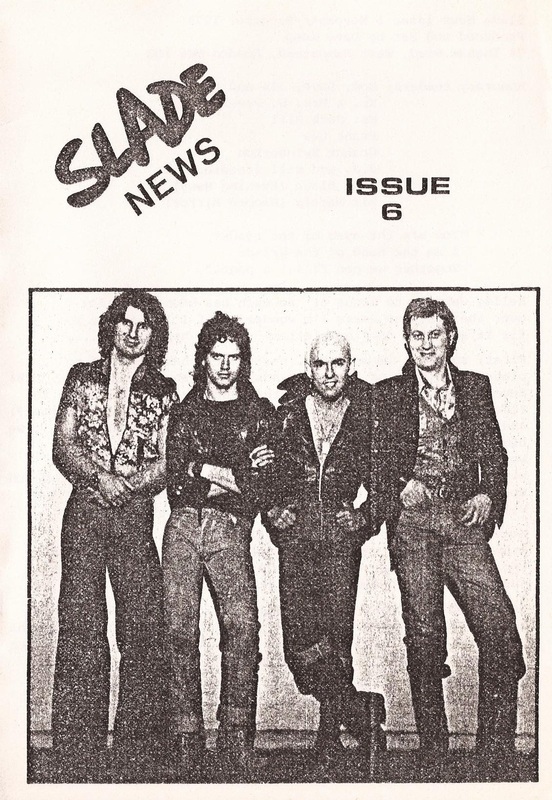 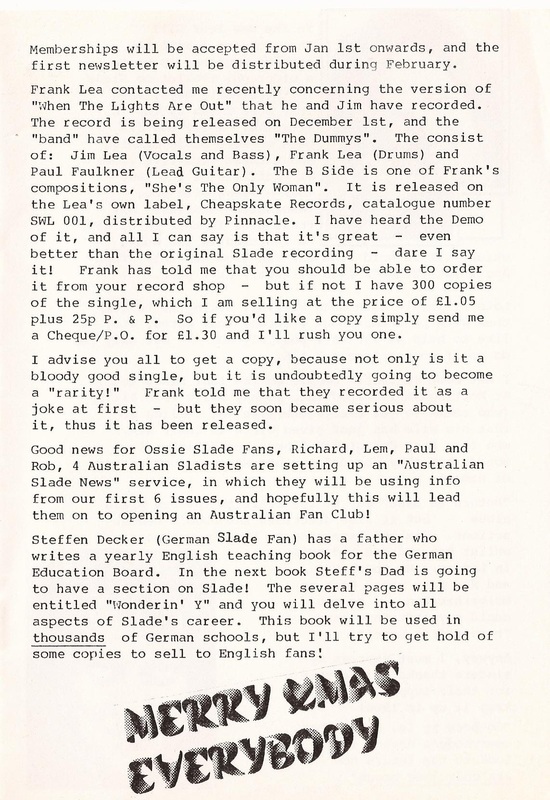 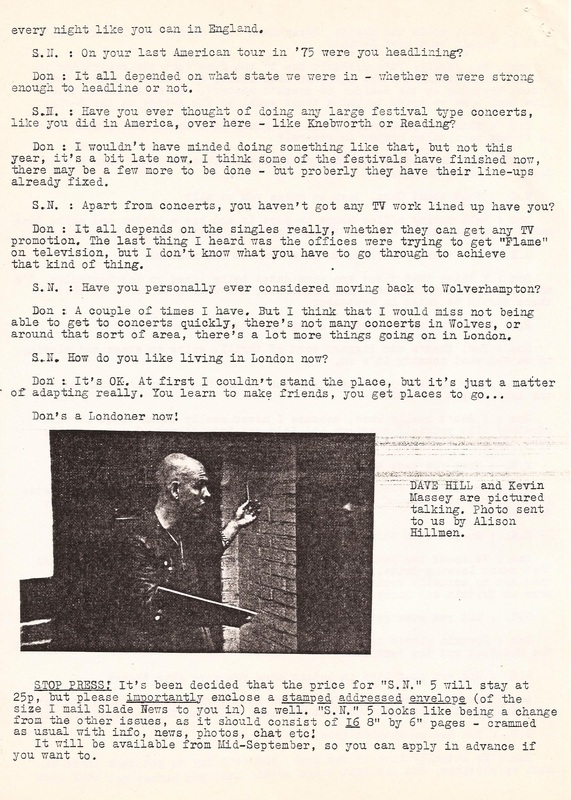 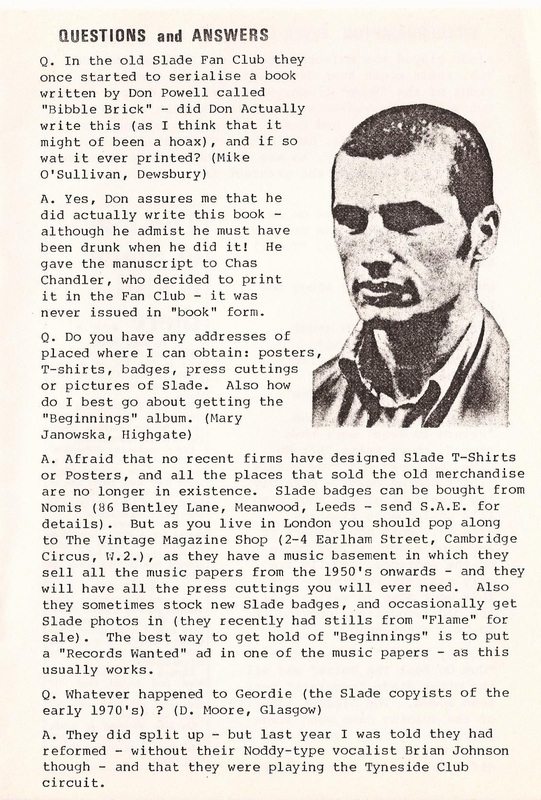 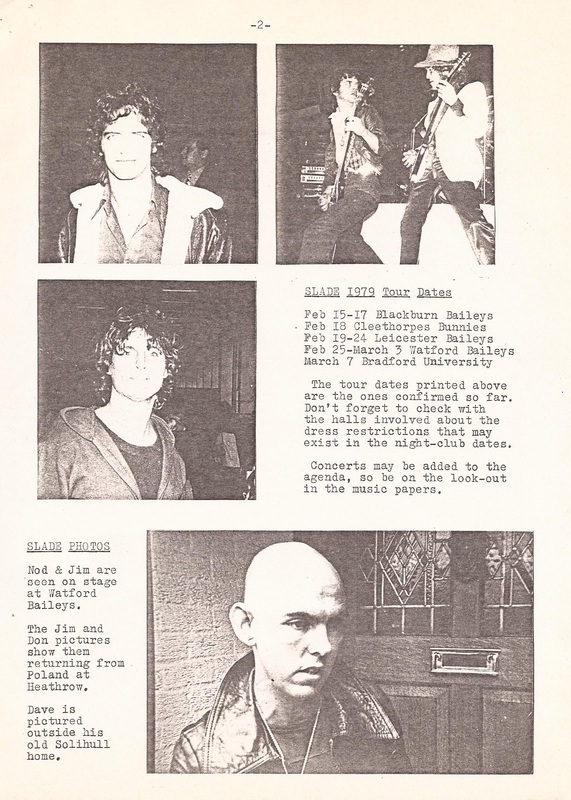 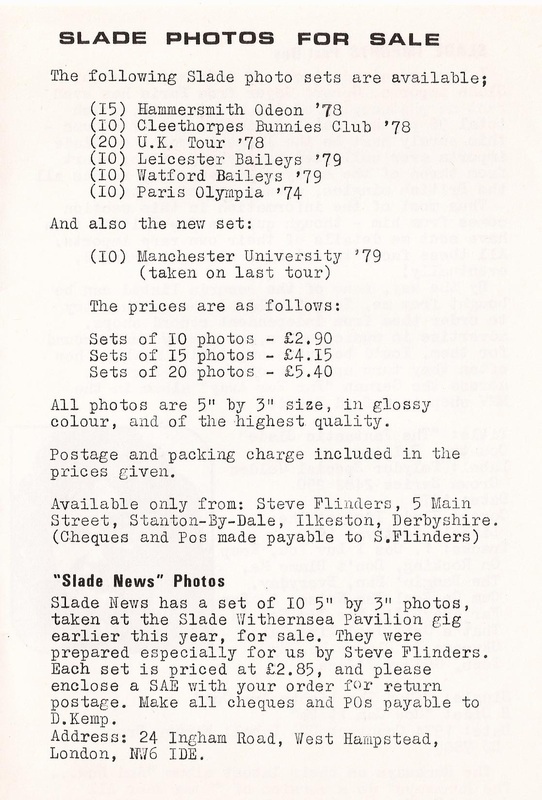 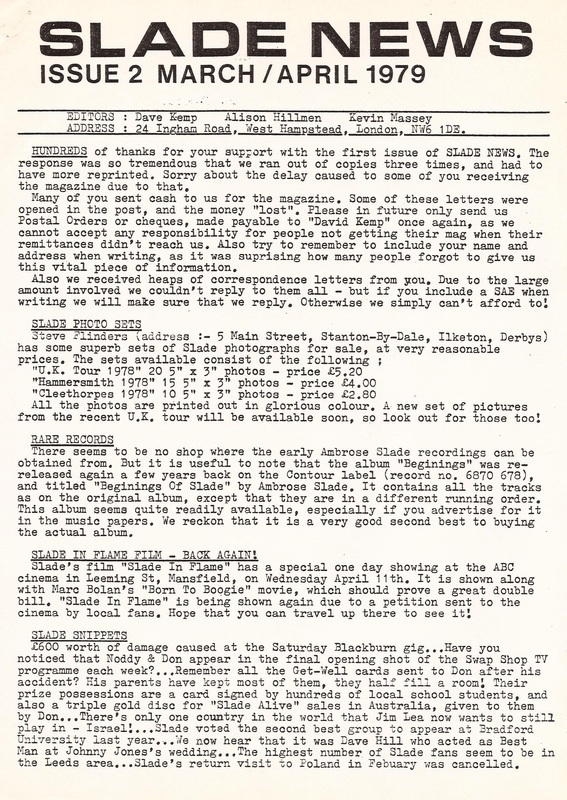 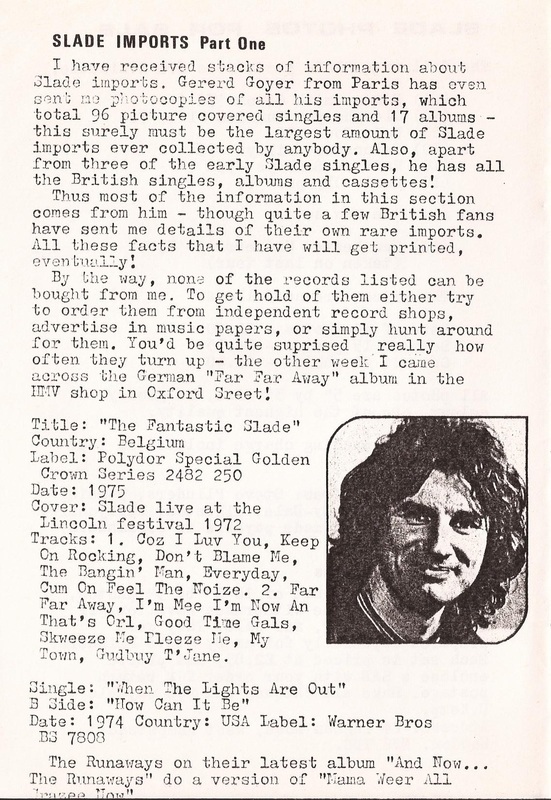 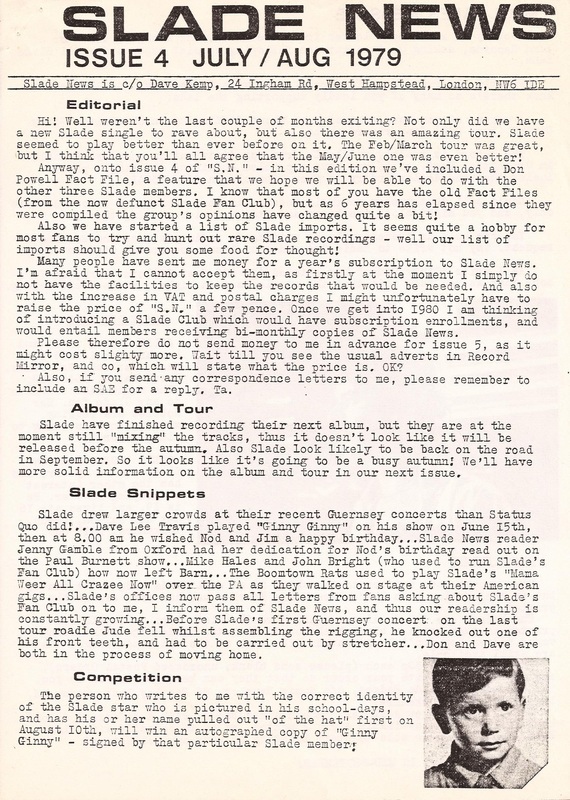 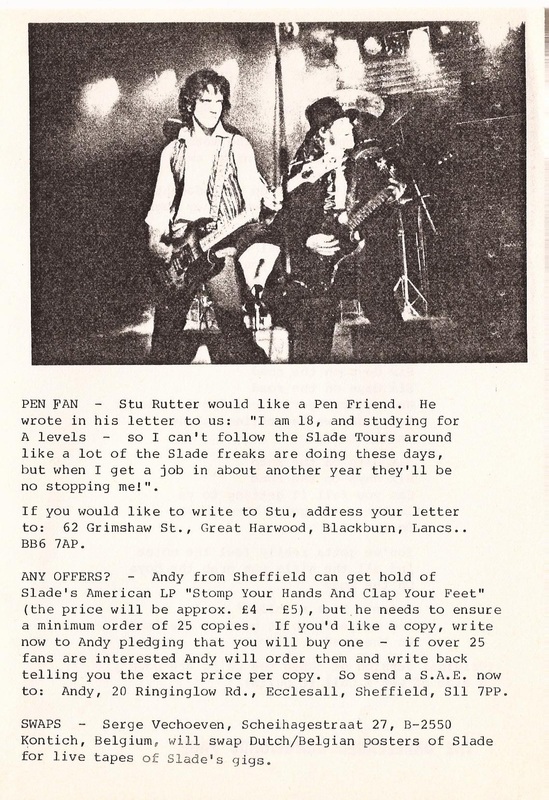 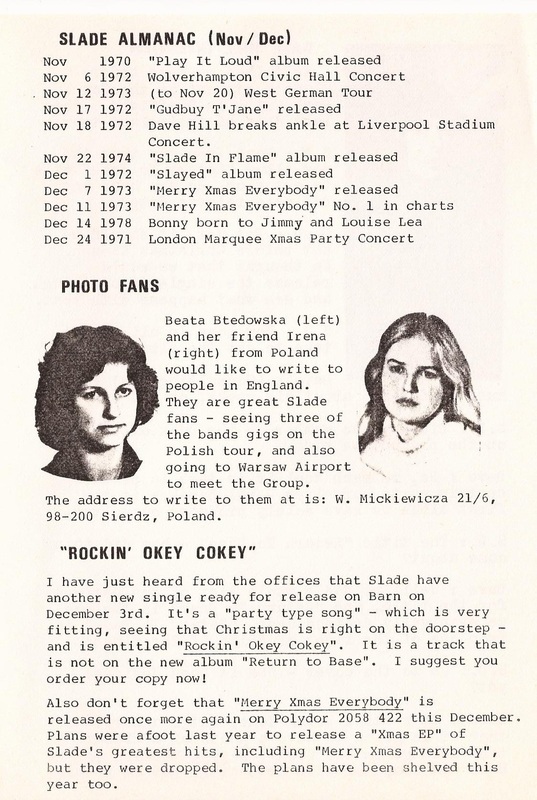 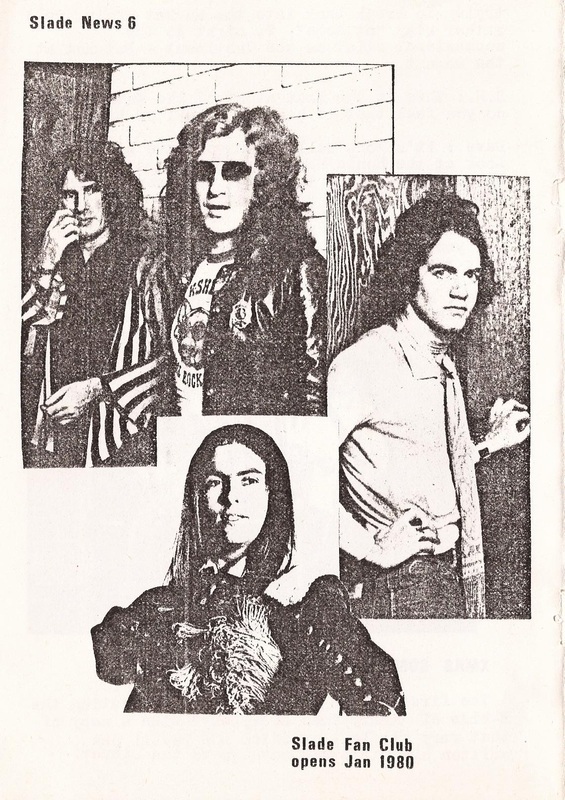 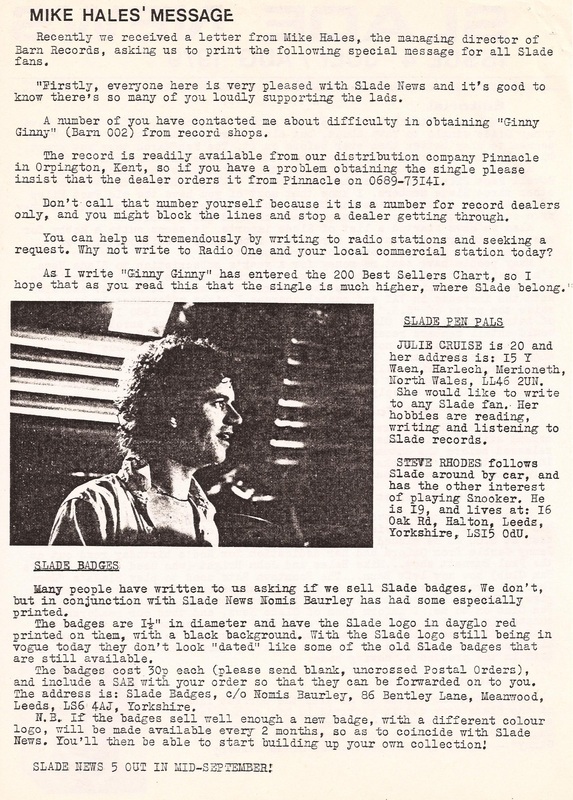 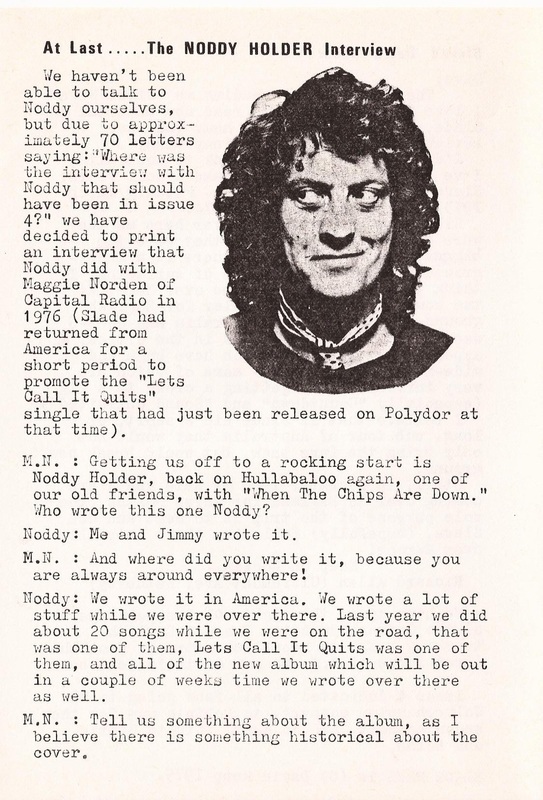 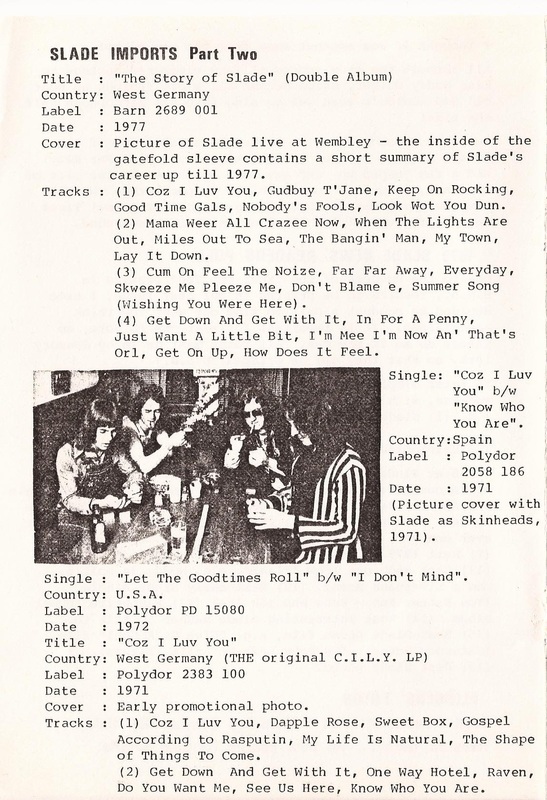 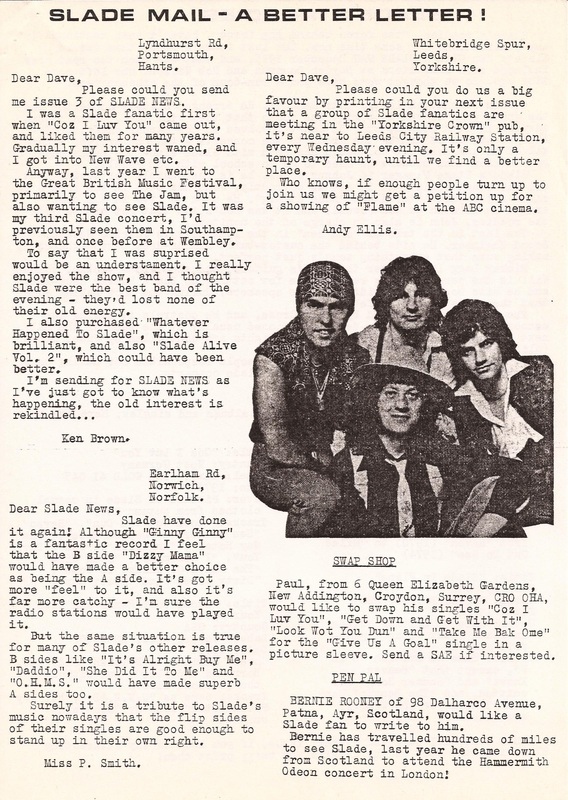 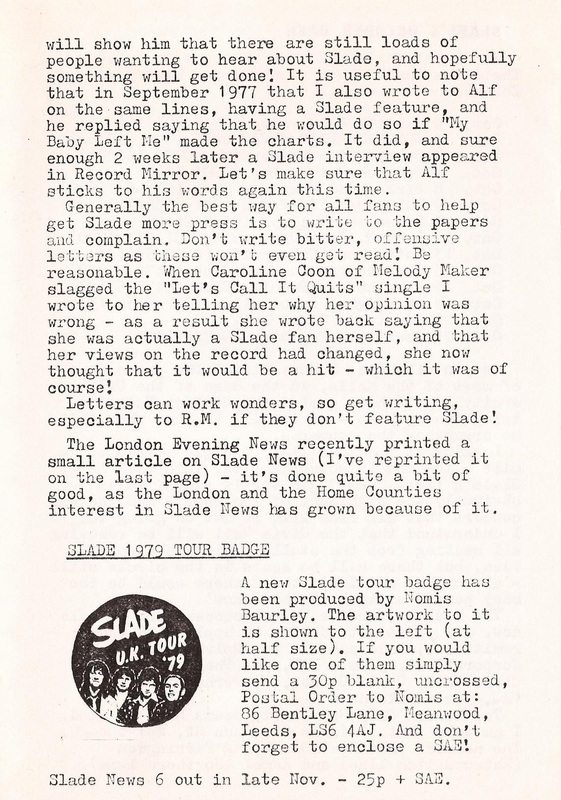 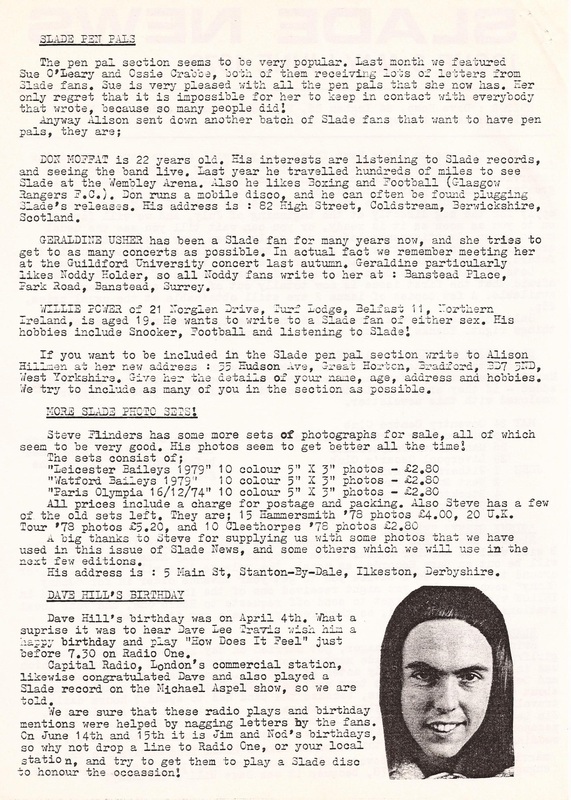 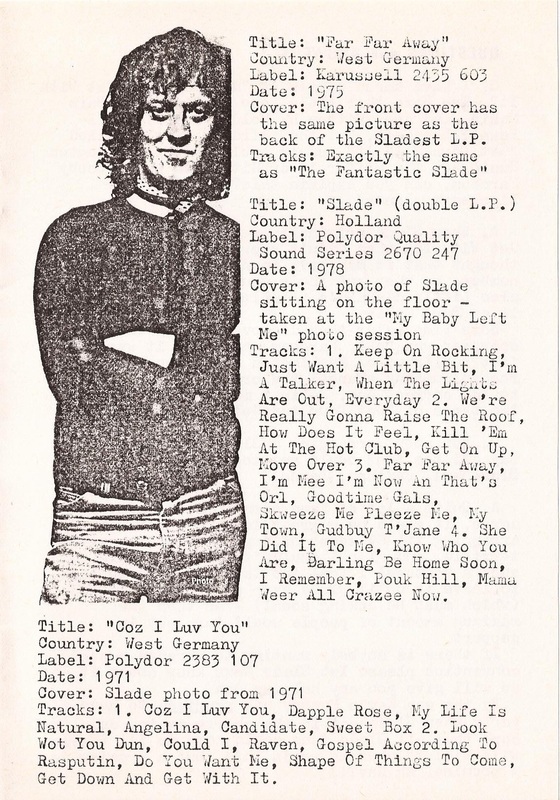 Therefore I decided to set up a bi-monthly fanzine, "Slade News". 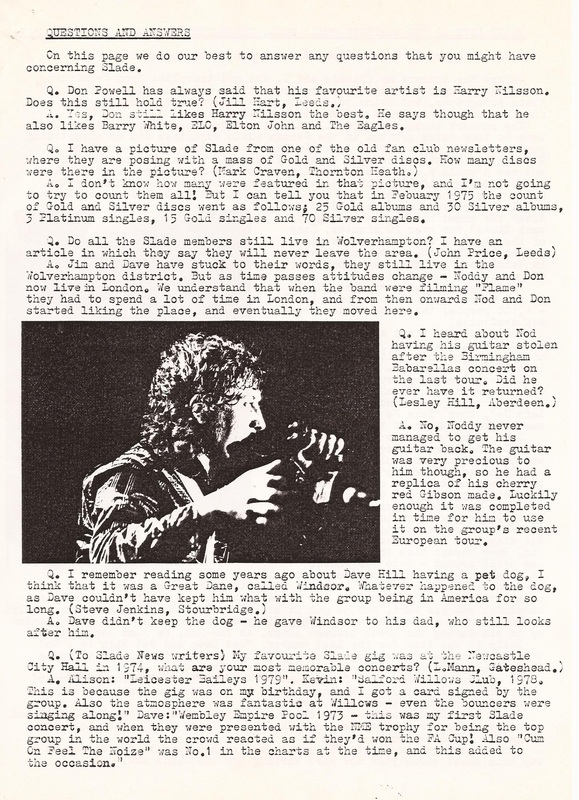 It was basic, very basic, because I had few skills in writing and no knowledge of printing techniques. 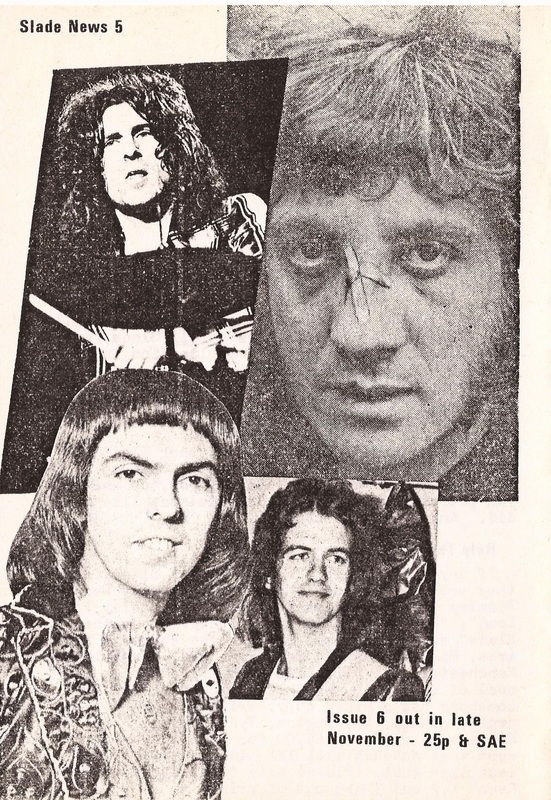 However, it served a purpose. 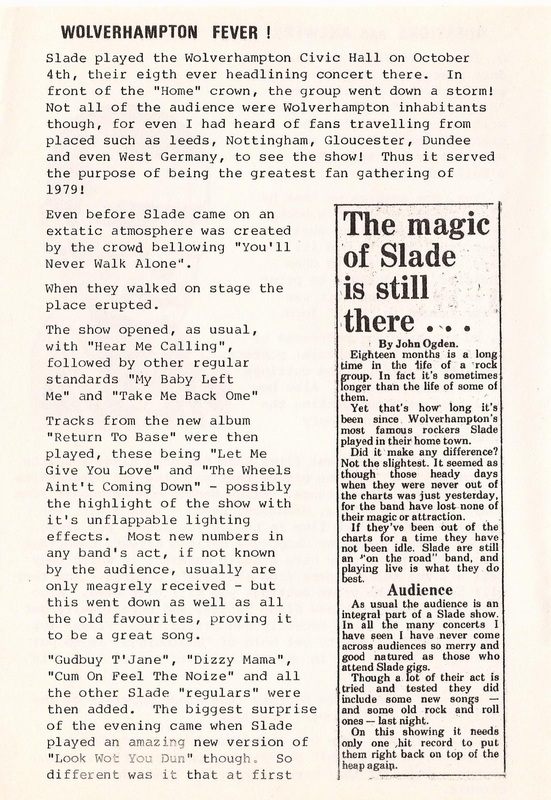 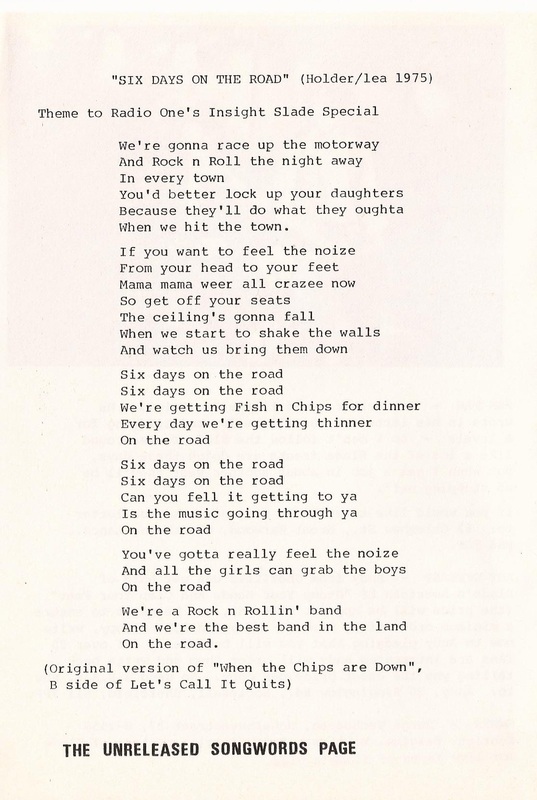 I created it, placed ads in the music press, and several hundred fans bought it to find out info about the band. 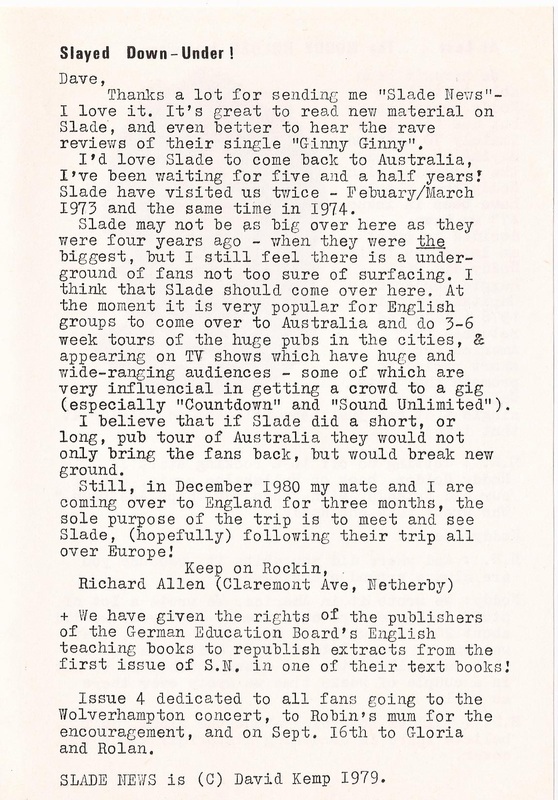 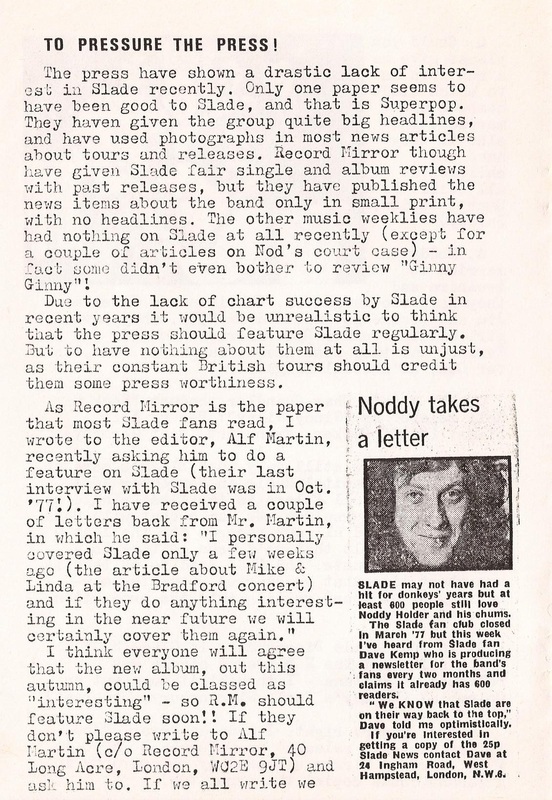 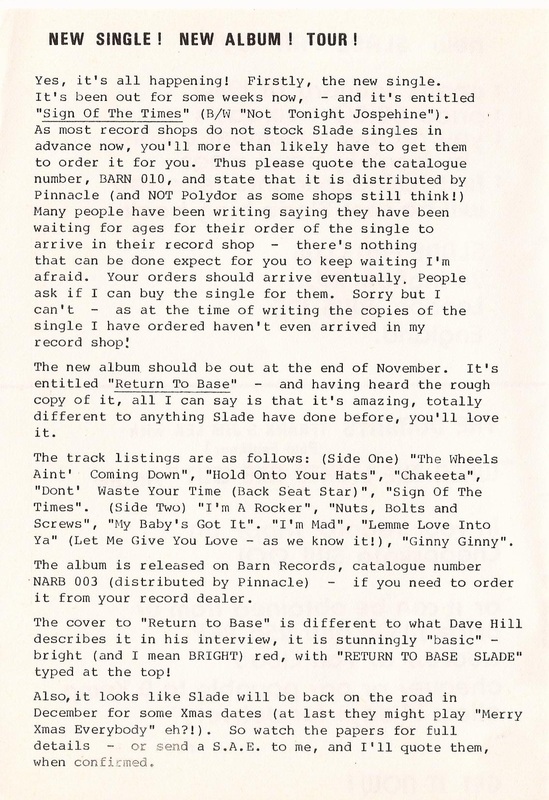 My agreement with Slade was that if I could make any money out of Slade News (or a Fan Club) then I could keep it for myself. 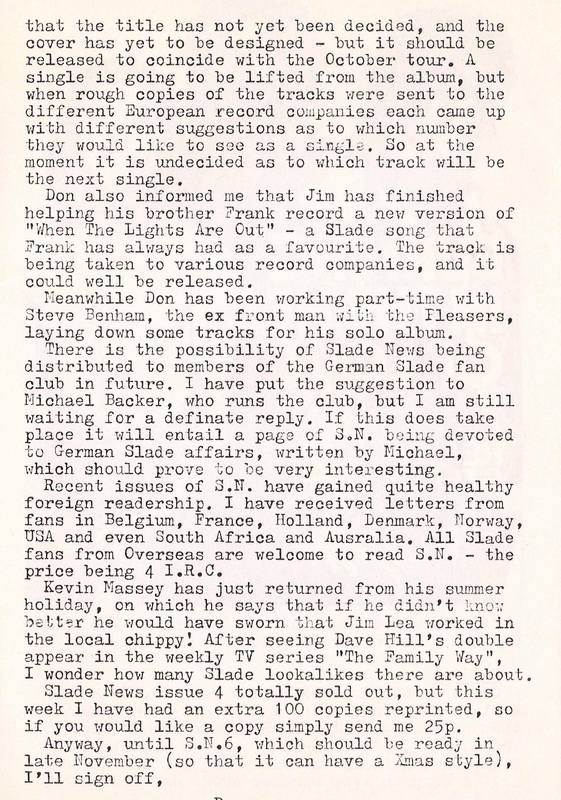 As it happens, any profits that were generated were ploughed back in to the club. 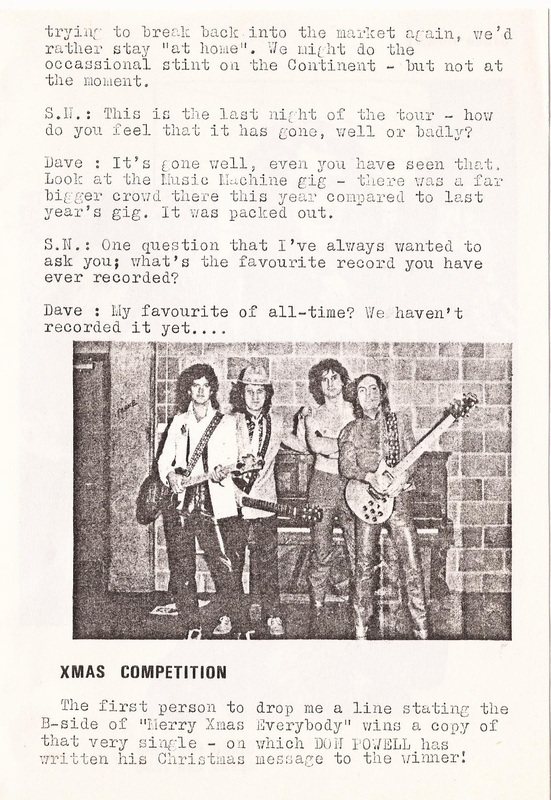 I did the job out of love for the band. 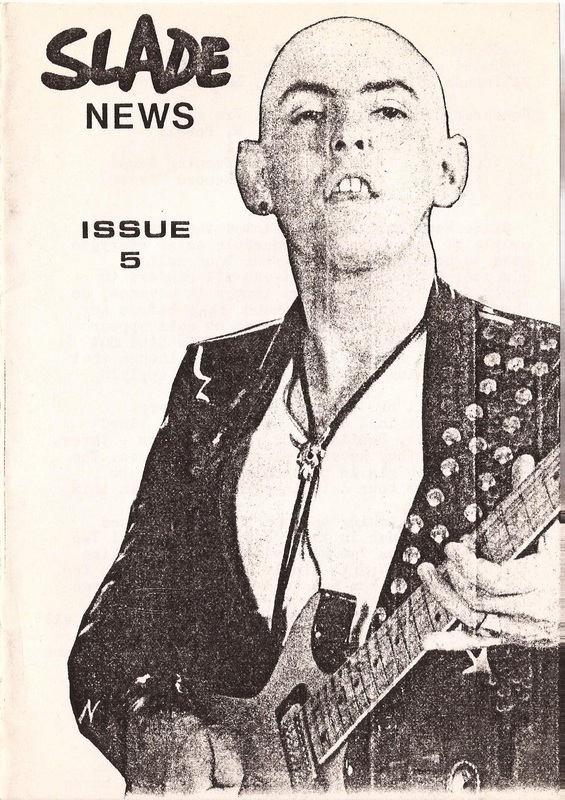 My first issue was published in January 1979.